Whether or not you agree that funnest is actually a word, you have to admit that this new bouncy, zig-zagging pedestrian bridge in Brooklyn is pretty darn cool. Designed by Ted Zoli and constructed by HNTB, Squibb Park Bridge provides a much-needed link over the BQE to connect Brooklyn Heights to Brooklyn Bridge Park. Reactions to the slightly unstable sensation felt when crossing the bridge seem to be mixed, but locals are certainly appreciating the newfound ease with which they can get to the waterfront. For a closer look at the bridge's unique design, click through our full photo gallery. Squibb Park Pedestrian Bridge opened a few weeks ago in March, just in time for spring. The $5 million bridge was built out of 100,000 pounds of black locust timber, a species that was originally used for ship masts hundreds of years ago. While you might feel a little bounce as you’re traversing the bridge, it’s important to stress that this is certainly no rickety Indiana Jones vine job. Black locust timber is resistant to rotting (which is probably why it has traditionally been used in shipbuilding), and is also considered a sustainable alternative to other woods. If you’re in the Brooklyn Heights/Brooklyn Bridge Park area, we highly recommend that you check out the bridge for yourself. And be sure to let us know in comments what you thought about the bounce. 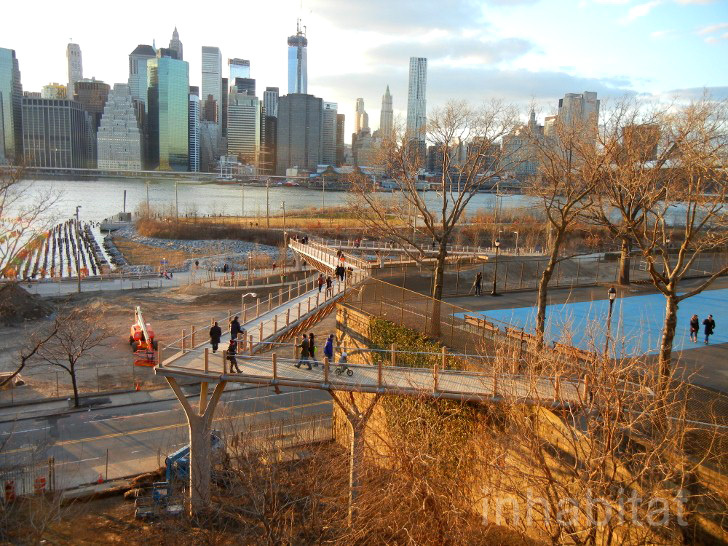 Squibb Park Pedestrian Bridge opened a few weeks ago in March, just in time for spring. The $5 million bridge was built out of 100,000 pounds of black locust timber. Black locust timber is a species that was originally used for ship masts hundreds of years ago. While you might feel a little bounce as you're traversing the bridge, it's important to stress that this is certainly no rickety Indiana Jones vine job. A view from the bridge over the BQE. Heading onto the bridge from the Brooklyn Bridge Park side. Black locust timber is resistant to rotting (which is probably why it has traditionally been used in shipbuilding). Black locust timber is also considered a sustainable alternative to other woods. If you're in the Brooklyn Heights/Brooklyn Bridge Park area, we highly recommend that you check out the bridge for yourself. And be sure to let us know in comments what you thought about the bounce. The bridge also has an unusual zig-zagging design.